We know that many people read this site, but have not made any contributions. Therefore Summer Glau Wiki will have a stop lurking day. If you are a reader and never left a comment. Please leave a simple hello message below or in this thread, so that the others can welcome you to the site. Now that i'm here, please let me grab this opportunity to adress myself to YOU. I was a lurker on a TSCC forum back in the days and started to post comments at a very late stage; in fact a few months before the serie was cancelled. Too bad. 1) as you alreday noticed, english is not my native language and i'm not fluent :(. Tip : i have always an open tab on http://www.wordreference.com to help me. Still i post comments. If i managed to do this, so can you . 2) I'm not a brilliant writer (native language or not), i'm fully aware of that. My comments sounds often dumb or inappropriate. One more reason to post because your own comments will sounds inspired compared to mine. 3) I have made a few ( alot ?) mistakes while posting here (posting paparazzi pictures *ouch* in violation of the Wiki rules, or double threads for example); each time the admins were here to repair my mistakes and indicate me the correct track. The Cape premieres in a few hours and i'm sure we will have a lot to discuss. As i said you have no reason to be shy and i hope we will make of this wiki an interesting and fun place to discuss. Am sorry for reticence, but even if I knew perfectly English, I would not talk much. Well, here's my story. Like michelangelo I was a lurker on the red wiki since TSCC started in Jan 2008. I think that was the first fan site I ever visited regularly. I've spent many hours every day on that wiki. I've witnessed almost everything that happened on that site during the first season and summer hiatus, and only in the second season it became hard to follow everything because activity increased dramatically. But it seems like nothing could make me join... until TSCC was canceled. I joined to support my favorite show and to keep activity on that site up. A lot of thing happened after that and I finally ended being here. Anyways, I've been thinking many times that if I joined the red wiki since the beginning many things would be different for me. I could have a chance to talk to people who stopped posting before I joined. We could have a more in-depth discussions on topics I had something to say, etc. By the way I see many people from Germany, Russia and other countries visit this site. Someone whose native language is not English may create specific threads for people from their countries. If my memory serves me well on the red wiki we had threads for people who speak German, Russian, Portuguese, Turkish, Chinese and probably a few other languages. I think we can have such threads here too. Reminder : there is more traffic on the site just before and after The Cape airs; that's why i wanted to bump this thread. It's more fun when you have feedback from others. When i post a comment, i can't wait to see how the others members will react to it, positively or negatively (preferabely first option). Whatever happens to The Cape, the journey is not over. I hope The Cape will have another season but if not, Summer Glau will still continue to illuminate our screens and our hearts (what a poet!). This wiki is here to stay and will continue to follow Summer, no matter what. Will you join us? 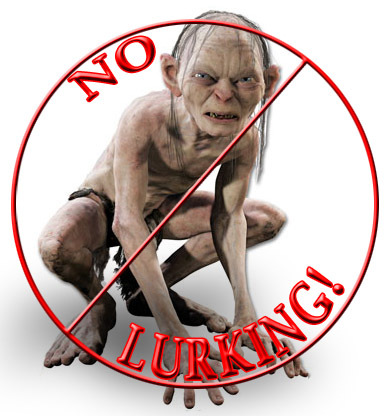 bumping this thread because we need more stop lurking days. The problem is as The Cape was canceled too soon and with no show there is little to discuss. I hope we get good news soon, but it will prolly take a while. Ok, I'm done. Somebody wanna' come move this soapbox?! With so many wikis around, i find it hard to spread my charm around!! I'll make it a point to be more active here guys !!! Thanks for your help meanoldmoe! A comment here and there help us to be sure we are on the right trails. If you don't like something on the site or want to improve a feature, don't hesitate to say it. The wiki is still evolving with everybody's help. "But the Precious loves us." "Wake up in the morning feelin' like P-Diddy..."
The traffic to this site is very good, but too few people is posting. As there is no news it get hard to find new topics, but we hope that this will change soon. We searching for new content 24/7 too keep this site updated, and put very much work in this site design/improving it features. This is all for free. What we ask for is more activity. We will not have more stop lurking days, but I wanna hear your suggestions how to improve and encourage more contributions. everybody can contribute after their best ability with fanart, photos, ideas and comments one does not need to be a graphic expert. Remember Summerglauwiki is a fansite that is build by the fans themselves and is very unique. There is no other site likes this. This is the wiki of awesomeness and we want you to help us make this site even more awesome. Also feedback comments on our news is always appreciated. When reposting material from this site on other sites it is always nice to mention that you found it at Summerglauwiki. It really helps to get the word out about this site.